It's hard to believe it, but my CSA season isn't over yet. Although the bags are slightly less full lately (which is inevitable and not altogether unwelcome), my supply of organic produce is going strong. As we get late into the season, I've amassed a small stockpile of onions which have made their way into salads, sauces, and salsas, plus plenty of other dishes. I was excited to discover this Sofrito recipe recently, along with these ideas for how to serve it. The cilantro-lime sofrito is simple and straightforward to make. 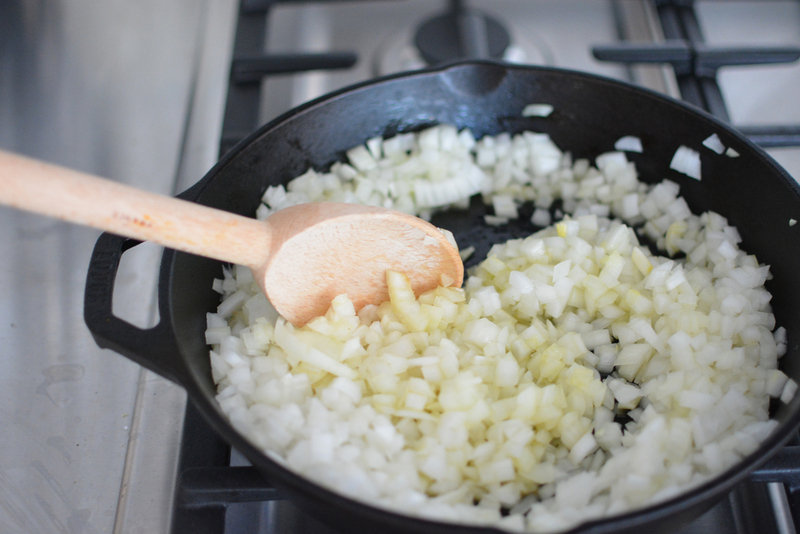 It requires a bit of patience, but doesn't need constant tending when cooking the onions. I checked in and gave the sofrito a good stir it every five minutes or so, which worked beautifully. The onions pick up a gorgeous golden color from the butter (even before adding the cilantro and lime) and the dish is deliciously fragrant. I added the finished product to pearl couscous, which I've served alongside roast chicken dinner and as the base in a roasted veggie bowl for lunch so far.